In just the last 3 days alone, I have wagered more than $100,000 on my picks! Want proof? Here are my betting tickets for Monday, Tuesday, and then yesterday on Wednesday. That’s $105,400 worth of betting tickets in 3 days. And this is still just base amounts with hardly any acceleration. Once I get on a good winning streak, you’ll see me ramp up my action to bet over $100,000 every single day on my picks as I surge ahead on my mission to show you how I can win a million dollars in profits from betting on sports during this baseball season. The key word here is to show you. Talk alone is cheap. Anyone can sit back and tell you how they can hypothetically win millions. I want to literally show you that I can win millions. 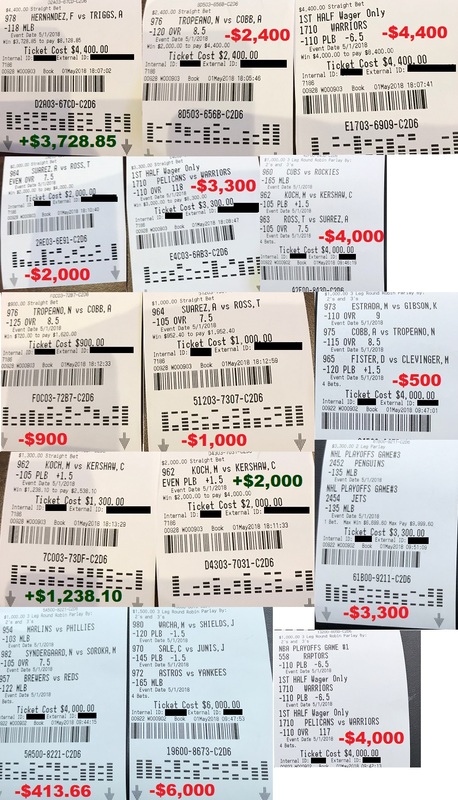 Would you take out $100,000 and bet it all on sports if you weren’t feeling sure that you’re going to win? Not a chance! When you’re following with me, you’re following someone who puts money where his mouth is and win only when you win. If I cannot help you win this week, I’ll be out over $100,000. 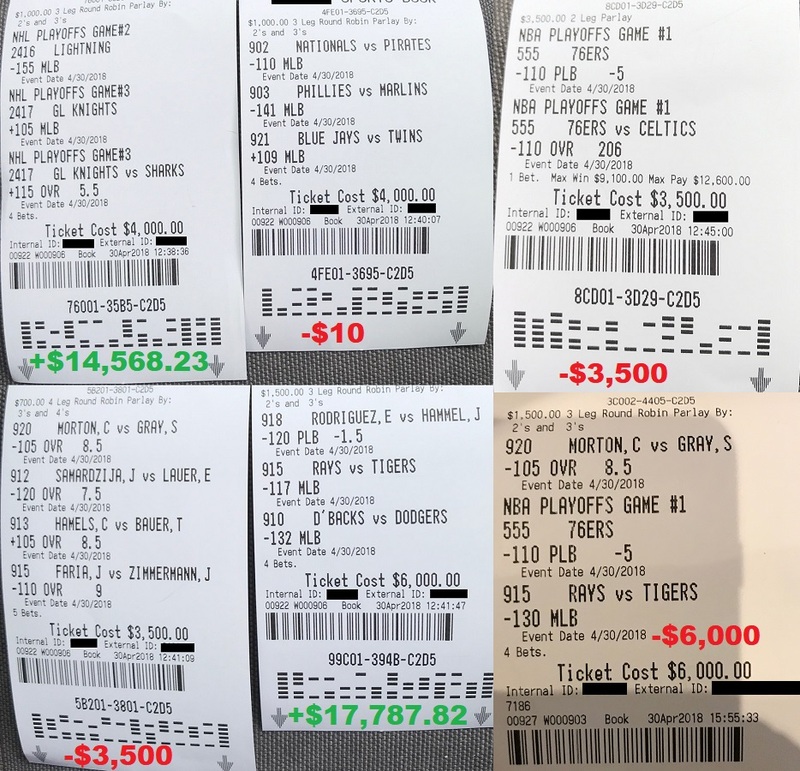 Unlike other typical touts whose fortunes rely on selling memberships, I’m a real life professional sports bettor who relies on betting on his own picks to make him his fortunes. When I have hundreds of thousands riding on the line every week on my picks, you can know for certain that the only way for me to truly benefit from this program is when I can help you win with me. Now, the key to the Round Robin betting strategy requires bettors to be patient and ride out the waves until the hot streaks hit. The problem is, this betting approach isn’t for everyone, especially for the faint-hearted. You’re expected to carefully manage your bankroll until the streak pattern kicks in. This means it’s possible for strings of losses to happen before catching a big streak. While this betting strategy was responsible in a big way to help me reel in tens of millions of dollars in winnings, it’s not a method that everybody can use. It might not be method that you can use. So if you don’t have the emotional capacity to handle the wild up and down swings of my Round Robin approach until the big streaks hit, I get it. You need something that can pull in for you winners consistently. Is that you? Are you someone who wants to win all the time? Is there a betting system where you can make simple straight bets and expect to win almost all the time?